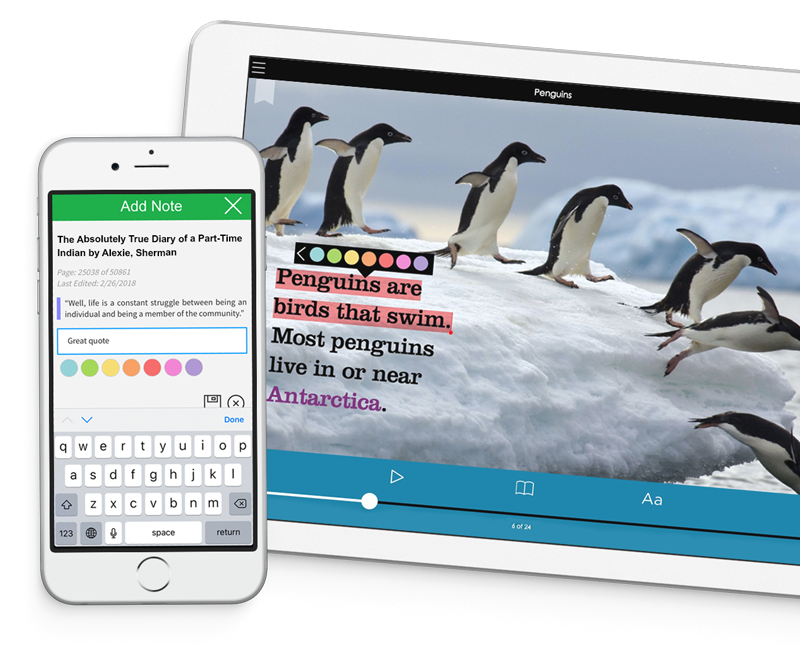 Mackin offers over 2 million read-alongs, single-user, multi-user, subscription, interactive and perpetual license eBooks ranging from pre-kindergarten to professional level. Over 1,100 eBook classics makes this the easiest, most economical way to build a quality digital library. Not sure where to begin building your digital library? We’ve created these bundles to help get you started. Perfect for reluctant readers, read-alongs are the connection point between auditory and linguistic learning. Custom, multi-user, digital subscriptions perfectly created based on the grades and topics of your choice. Science, Math and Geography with the books and interactive eBook technology. easy navigation tools and enhanced content that supports readers of all types and ages. They allow emergent readers to follow along as text is read, engage struggling students and English Language Learners in classroom and group reading activities, and give reluctant readers a new way to make reading and learning fun! text, write their own content, and publish their work. Students can choose to read the book and enjoy the rich media experience or to complete a writing activity as they read the book. Lerner Audisee eBooks with audio engages readers. Lerner Interactive eBooks give readers at all levels a new way to build confidence, skills, and make reading and learning fun – not frustrating. They feature unique educational activities and resources to extend the reading experience. Lerner Digital eBooks support class reading, pleasure reading, report writing, research and instructional delivery in K-12 classrooms. Share eBooks simultaneously across your school for one low price. Multi-user access means no holds and no waiting-just learning and great reading! eBooks focus on a safe place for students to explore informational text and provide for them a rich media experience. CyberSmarts – This series provides readers with a wealth of knowledge about online safety, exploring everything from avoiding online predators to stay safe when playing online games. Teen CyberSmarts – Geared towards teens, the goal of this series is to create savvy cybercitizens who don’t fear the Internet, but can make informed and sophisticated decisions every time they sign on. Spotlight On – For grades 3-8 and built to support the C3 SS Framework, NGSS, and state standards. With a hands-on approach that inspires active learning, Spotlight On immerses students in science and social studies topics. science, math, social studies, high-interest, bilingual, and Spanish Language books. Also featured are leveled reader fiction titles in addition to the informational titles. Rourke educational e-Books are leveled by Guided Reading Levels (GRL) and are correlated to Common Core State Standards, Texas TEKs, Virginia’s SOLs, as well as other state and national standards. eBooks allow children to read aloud at their own pace. Audio eBooks include Sesame Street audio narration, sound effects and music. Interactive eBooks invite children to interact with the content in playful and educational ways. Animated eBooks bring beloved Sesame Street characters and stories to life in full-color animation. from the world’s great oral traditions. Each animated story is leveled and includes differentiated lesson plans to supplement any reading curriculum from K-2nd grade. The easy to use, award-winning platform was developed with classroom teachers to help emerging readers strengthen their core reading skills. EBSCO offers over 500,000 high-quality eBook titles from top traditional and university publishers, ensuring that you’ll find valuable, trusted content with every search. Build a collection from a growing selection of best-selling, frontlist and award-winning eBooks across a wide range of subject matter— including academic titles, popular fiction, nonfiction, earth science, social studies, world cultures and more.